My Dad has been frail (his diabetes has been so difficult and has taken a toll on his life and on our family), as I write this today is #Americandiabetesalertday, Diabetes is a matter near and dear to my heart because I have dealt with my Dad’s illness and seen first hand how devastating and how life consuming it is. I was feeling stuck trying to be a jack of all trades and being a rockstar at it all whilst looking madly for a house for my Baking School here in Austin and at the same time trying to set up my healthy baking classes through Airbnb experiences which just launched in Austin! Whoohooo.. Still figuring that part out. But hey imperfect action is what entrepreneurship is all about right? And consistency is key. Anyway back to these scones! When Bulletproof reached out to me a few months ago and asked me to develop 4 Bulletproof friendly pastries for them I was beyond honored, challenged and grateful! One of my wellness heroes is Dave Asprey and I listen to his podcast every week. I am a raving fan of his Bulletproof lifestyle, bars, ingredients and supplements. When I made these scones I remember the feeling of complete bliss and utter satisfaction of having created a recipe that not only was Bulletproof friendly (gluten free, dairy free, low glycemic, grain free and compliant with the Bulletproof road map (something you need to look into). When you read about it you’ll see that there are literally very few flours and sweeteners to bake with and the ones that are BP friendly have a scientific reason why: all ingredients are the healthiest to give you the most energy and what I call high performance foods. I am thrilled to be a consultant for Thermomix and have been using and loving my cooking food processor for 13 years! I highly recommend it for everything: from making these scones to making pizza sauce. Paleo low carb scones, crispy on the outside, moist inside. I developed this recipe for Bulletproof (not a sponsored post, thanks Bulletproof for the ingredients for this recipe!). 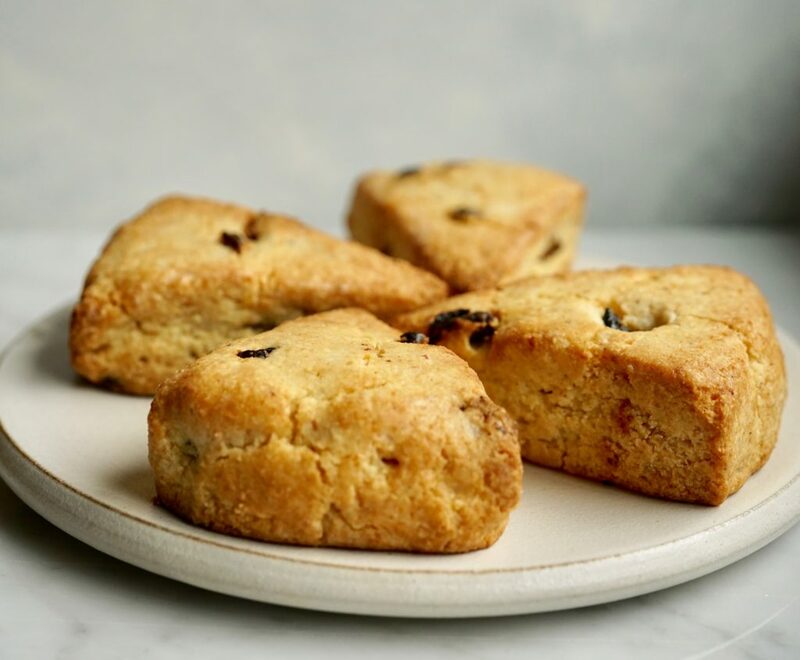 The perfect balance of paleo flours makes these scones just like traditional ones, you will love the texture! 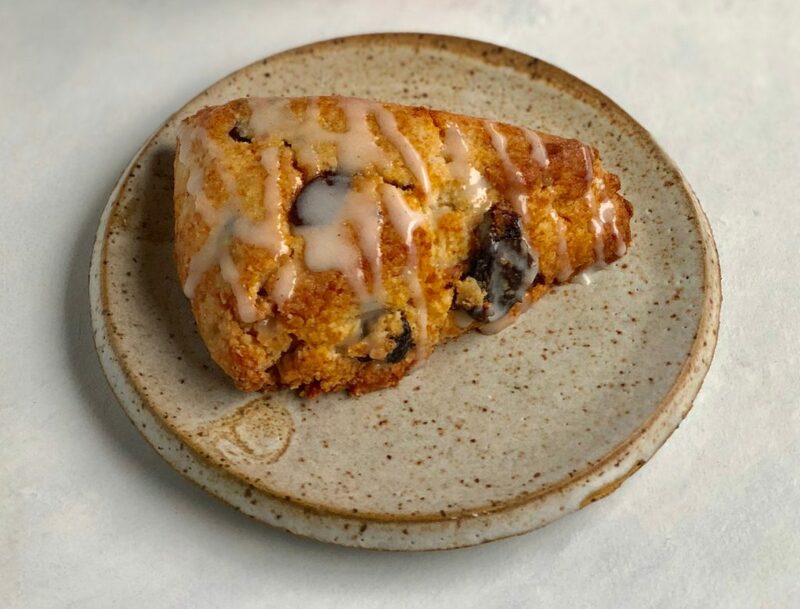 I love baking with Lakanto Sweetener to create low carb pastries. 2 tablespoons organic flax seeds freshly ground (grind these in a coffee grinder) we don’t recommend you buy flax meal it’s not Bulletproof friendly, you can substitute for the same amount of Bulletproof Collagen! In your food processor (I used my Thermomix) incorporate the flours, sweetener, lemon zest, and dry ingredients. Then add cold ghee and process until crumbly (check that your butter looks like lentils) remove mixture from food processor and put into a large bowl: add currants and add the coconut yogurt (small amount first) combine just until integrated. Don’t over mix. Line a baking tray with Silpat or Silpain or parchment paper. Put the dough onto the baking tray and form into a round ball, press down to form a 2″ high round loaf. Cut into 8 slices and shape nicely formed triangles: freeze for 30 mins, brush with extra coconut cream, then bake in a preheated oven at 350 F for 5 minutes until golden brown. Lower temperature to 340 F until baked through (they must be crunchy on the surface and moist inside) total temperature takes about 20 min. Notes: you can make ½ recipe just use half all the ingredients. What is the carb count for each scone? Hi Tina, I don’t do the nutritional information for my recipes but you can do it on any recipe app such as ReciPal or My Fitness Pal. And it also depends on what ingredients you use. Hope that helps! Hey Buddy!, I found this information for you: "BEST PALEO LOW CARB SCONES". Here is the website link: https://www.vanessamusi.com/best-paleo-low-carb-scones-ever/. Thank you.